Cool Tools: Is This the Only Adhesive You’ll Ever Need? With all the specialized adhesives out there, wouldn't it be great if just one tube could do it all? Well, here's one that can tackle most materials, indoors or out, in extreme heat or cold, and even in wet conditions. Sound promising? Read on! Imagine that you’ve just spent several hours—the better part of a weekend afternoon—painstakingly adhering ceiling tiles overhead. Moments ago, you set the last square into position, when suddenly, seemingly out of nowhere, every single tile crashes to the floor. Ugh! Making the situation all the more frustrating is the irony that the adhesive you were counting on to save time and effort ended up being the reason you wasted both. If there’s a lesson to be learned, it’s simply this: The right adhesive often spells the difference between completing a satisfying, successful project and finding yourself all the way back at square one. The trick is finding the best adhesive for the job. 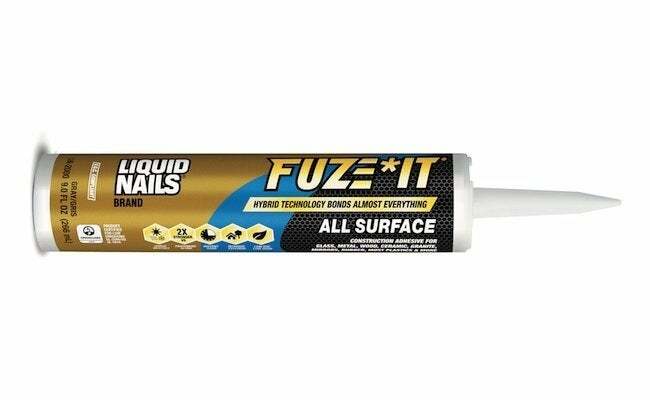 Liquid Nails Fuze*It promises to be the construction adhesive you can truly depend on for any number of jobs, whether you’re putting up paneling or simply fixing a loose cabinet drawer pull. The remarkable versatility of the product hinges on a hybrid technology that enables Liquid Nails Fuze*It to bond just about everything to just about everything else. In fact, there are only two materials for which it’s not recommended—polyethylene and polypropylene. Otherwise, Liquid Nails Fuze*It works for all the most common household materials, including but not limited to glass, metal, wood, marble, granite, rubber, laminate, tile, and foam. Equally handy is that Liquid Nails Fuze*It, unlike many other adhesives, remains effective even when it’s in contact with water. If the project calls for it, you can even apply Liquid Nails Fuze*It in the pouring rain, with no sacrifice in the quality of its bond. Further, Liquid Nails Fuze*It can safely withstand punishing environmental extremes, because the adhesive holds fast in temperatures up to 300 degrees Fahrenheit or down to 40 below zero. You may in the past have stocked a slew of different adhesives, each specially formulated for a particular use. Now, with Liquid Nails Fuze*It up to pretty much any task, indoors and out, and effective under even the most challenging conditions, you may need only one adhesive. Because Liquid Nails Fuze*It creates a bond twice as strong as fasteners alone would, you might suspect that the product would be unwieldy or difficult to work with. But in reality, Liquid Nails Fuze*It makes application convenient for pros and DIYers alike. Case in point: The adhesive offers instant grab, which means that clamping, taping, or otherwise bracing the bond requires neither finesse nor surgical precision. Simply unscrew the nozzle, cut the plastic tip of the nine-fluid-ounce cartridge to the desired bead, screw the nozzle back on, load it into a standard gun, and apply the adhesive. Clamp if necessary, then wait four to six hours for Liquid Nails Fuze*It to set (for porous surfaces). That’s it! Assuming a quarter-inch bead, you can cover about 27 linear feet with a single cartridge. In other words, unless you are undertaking something extra ambitious, you don’t need to worry about running out of adhesive just when you need it. More important, with Liquid Nails Fuze*It you also don’t need to worry about potential health effects. These days, increasing numbers of contractors and homeowners are concerned about the harmful effects of volatile organic compounds, and justifiably so. You can set these worries aside with Liquid Nails Fuze*It, which carries Greenguard Gold Certification, a designation for products scientifically proven to reduce the risk of indoor air pollution and toxic chemical exposure. Versatile, strong, and easy to use, Liquid Nails Fuze*It now joins the ranks of adhesives, caulks, and sealants that have made Liquid Nails a go-to choice in building and home improvement for nearly five decades. If your toolbox has room for just one tube, Liquid Nails Fuze*It may be the top contender for that coveted spot—and it’s certainly your best bet for tackling whatever adhesive need is next on your to-do list. – Purchase Liquid Nails Fuze*It exclusively at The Home Depot. This post has been brought to you by LIQUID NAILS Adhesive. Its facts and opinions are those of BobVila.com.